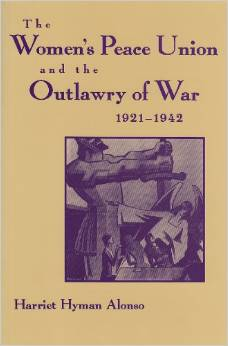 The Women’s Peace Union and the Outlawry of War, 1921-1942, The University of Tennessee Press, 1989; reissued, Syracuse University Press, 1997. What would you think of a group of women who believed that you could make war illegal by passing an amendment to the U.S. constitution? Crazy? Super idealistic? Practical? Well, you can learn all about one organization, the Women’s Peace Union, whose suffragist and pacifist members dedicated themselves to just such a program from 1921 to 1942. And they were not alone. Senator Lynn Joseph Frazier of North Dakota supported their work by sponsoring senate hearings, giving interviews, and generally speaking on their behalf from 1926 to 1940. 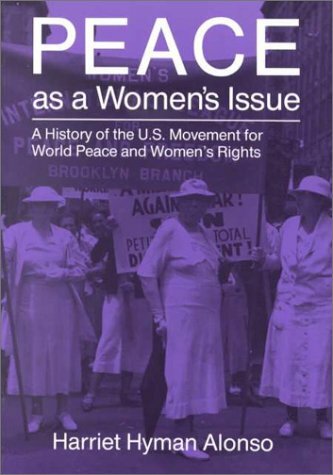 Peace as a Women’s Issue: A History of the U.S. Movement for World Peace and Women’s Rights, Syracuse University Press, 1993. After I completed writing The Women’s Peace Union which began its life as my Ph.D. dissertation, I decided to write a book on the history of the U.S. women’s peace movement. What an exciting adventure it was! I looked at women and organizations which saw peace as a matter of women’s rights. From the antislavery movement to the first Gulf War, many women echoed the connection between war and militarism with violence against women and children. If women had political equality with men, they could affect governmental policy and bring about peace and justice in the world. 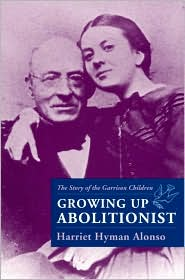 Growing Up Abolitionist: The Story of the Garrison Children, University of Massachusetts Press, 2002. Recipient of the 2003 Warren F. Kuehl Book Prize from the Society for Historians of American Foreign Relations. Wherever I turned in my research into peace history, I bumped into the great antislavery leader William Lloyd Garrison and his daughter Fanny Garrison Villard. Hmmmm, I thought. Is it possible that activism ran in families? I decided it might be fun to look into this and found after ten years of hard work looking at thousands of letters and other documents, that indeed, it did. Garrison and his wife, Helen, raised five children (George, William, Wendell, Fanny, and Frank) to care about human rights. Growing Up Abolitionist is a biography of this entire family from 1776 to 1928, and what you read might surprise you as much as it did me. This nineteenth-century family led me into the world of dress reform, food reform, health reform, spiritualism, raising children in a free and undisciplined environment. . . and a ton of serious issues as well, such as human rights, pacifism, and abolitionism. Robert E. Sherwood: The Playwright in Peace and War, University of Massachusetts Press, 2007. Project received a National Endowment for the Humanities Research Fellowship Award, 2005-2006. I’ve always loved the theater. When I first started college, in fact, I was a theater major. But life happens, and I ended up on another path. In 1990, I attended an NEH summer seminar for college teachers on U.S. playwrights from 1920 to 1980. Professor Howard Stein who led the seminar suggested that I take a look at Robert E. Sherwood for a possible research project. In 1917, Sherwood dropped out of Harvard University to fight in World War I. 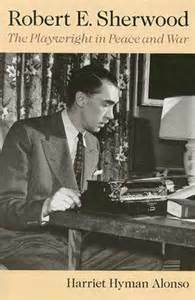 He came home an injured and disturbed veteran who used his pen to write plays and screenplays against war and other subjects. Have you ever seen the film or play, The Petrified Forest which launched Humphry Bogart’s film career? That’s a product of Sherwood’s fertile mind. As WWII approached, Sherwood’s political view began to shift, and as one of the country’s most famous playwrights, he was invited to join President Franklin Roosevelt’s speech writing team. He was in that position when FDR died in April, 1945. After the war, Sherwood penned the screenplay for The Best Years of Our Lives, one of the all-time great Hollywood films. He also struggled with his hatred of war with his equally strong hatred of communism. This book is a political biography of Sherwood with lots of glimpses into his life as a precocious theatrical child, a too-tall recruit for the U.S. Army, an angry husband and distant father, and a brilliant writer and producer of Broadway plays. 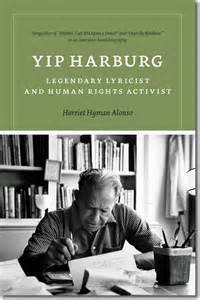 Yip Harburg: Legendary Lyricist and Human Rights Activist, Wesleyan University Press, 2012. Is there anyone in the world who doesn’t know something about the film, The Wizard of Oz? or hasn’t heard the song (Somewhere) Over the Rainbow? Well, the man who wrote the words for all the songs in the film and much of the dialogue was Yip Harburg. In fact, Yip wrote over six hundred lyrics and a bunch of pithy poems as well. When I was asked to write a book for the Wesleyan series, Music/Interviews, I decided to take Yip’s many interviews and weave them into a biography about his work. I originally titled the book Yip on Yip as I designed it as a venue for Yip (who died in 1981) to tell his own story. It was also a fun book to work on as Yip took me on a journey through his music, including such favorites as April in Paris, It’s Only a Paper Moon and the entire score of the musical Finian’s Rainbow. I literally sang my way through the project. Yip Harburg, as Robert E. Sherwood did before him, allowed me to combine my love of theater with my commitment to human rights. How did I not know you have written all of these amazing books? I want to read them all right now! I am really excited to learn about these books. The subjects are of great interest to me. It has been over 20 years since you were my professor at FSC. You were such a great inspiration for me and so many of my classmates. I don’t think I clearly articulated that back then so here it is for the record :). I wish you all the best in your future endeavors as you continue to inspire young minds. And just one more time, thank you!